Get the Meme from the Downloads Page! In my original video … I used a mall-scene stage and added a crowd of onlookers to be watching as my man gave his impassioned speech. For the purposes of this meme, there is motion data for only one model … a camera .vmd file for the motion as shown in the demo video, the WAV, and a couple of Target Store images that you might use for a background. Make this Meme your own! Get the Meme from the Downloads Page! 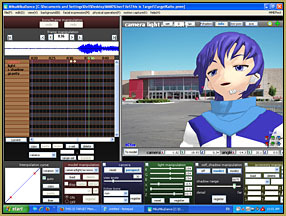 The TargetMan.vmd and Camera.vmd files are based upon your using the original Animasa Kaito model that came with your MMD download. You will want to adjust the camera motion to suit whichever of your models you might use. You will want to add more motions to your model … maybe fine-tune the mouth action or simply do your own lip-sync motions from scratch … maybe more arm waving … go for it! Modify the actions, provide your own stage … create your own version of this inspiring and energetic speech! Have fun with it. Modify it to create your own version of this inspiring and energetic speech. Please keep the positive energy going! … This little speech is a wonderful high-spirited pep-talk. Make something wonderful with it! DISCLAIMER: This little animation is just for fun. 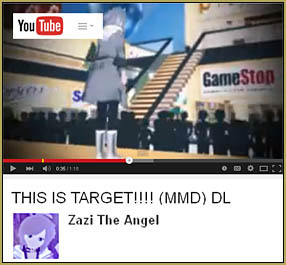 Zazi and LearnMMD.com have no relationship to/with Target Brands, Inc. and have no specific permissions to use the included audio and images. PLEASE use these files only for your own amusement in private or online … and never use them in any “for profit” venture or in any defamatory way. 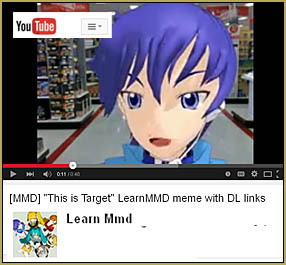 Make Target proud of what they see of the MMD Community! Thank you.